Grape Growing Growing grapes in containers is probably the best way for the amateur gardener and in Spain you will often see grapes growing on patios. Grapes are fairly easy to grow on a small scale for even the amateur home gardener, although maintaining a vineyard might require a little more skill! They can be grown in any temperate region which has summers with temperatures above 20°C, although they do require some degree of protection from rainfall. While grapes can be grown in containers, they actually do resent this, since they dislike having their roots cramped, so within reason cotainers should be of a reasonable size. Grape vines are very voracious plants, and can grow to 35 metres long-tall if given good enough conditions and left unchecked. Growing them in containers shortens their lifespan and lessens their yield, but restricts them to such an amount that they become easy to grow, and since they are kept small, more can be grown. Grapes are best bought in late Spring from garden centres or specialist nurseries, when they are coming into bud and a good plant chosen. The minimum pot size that should ideally be used is about 12 inches in diameter, maximum about 36 inches diameter. The richness of the potting material used is not important; it should have some degree of organic matter, but the structure of the soil is the most important factor; it must be fairly open and free-draining. Grapes should be kept well watered during first growth, flowering and initial fruit set; however after this they do prefer hot, dry conditions; it brings out a stronger flavour in the fruit. You will of course of seen that over here in Spain like in many other Mediterranean countries they shield the grapes in the vinyards in late summer with plastic covers to keep the rain off them, plus birds if you are not careful will soon find your grapes and will strip a vine in a fairly short time. Grapes should be left on the vine until fully ripened; they are preclimacteric; that is, they do not ripen further when taken off the vine, and the longer they remain on the vine, the higher the sugar content, and therefore the sweeter, and nicer, the grape. Because of the ripening nature of grapes, that they don\’t all grow and ripen at once, it may be necessary to leave them on a long period of time, whereby some will be riper than others, to get full ripening of an entire cluster. Cutting-Grapes If more plants are required, propagation is easy; any semi-ripe cutting will easily root in Autumn. Today Spain has more then 146 acknowledged vine varieties, making Spain one of the most varied wine cultures in the world. 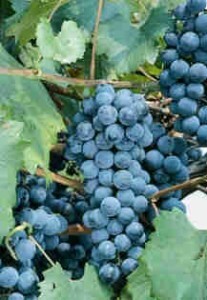 The Garnacha grape is the most common red grape in Spain. 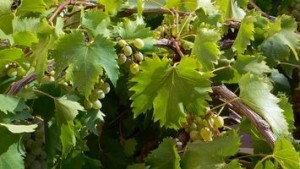 Among white grapes the most popular is Airén, which is also the most commonly grown grape in the world. Spain has over 650,000 hectares of vines. There are several groups; table grapes include Thompson Seedless, Flame and Crimson, Raisin grapes include Thompson Seedless, as do juice varieties which also include Concord. Wine grape varieties can vary, but include Pinot Noir, Merlot, Zinfandel, and Cabernet Sauvignon. You may notice these are actually names of wines; the wines take their name from the grapes themselves. Thompson is one of the most popular grapes worldwide, not only is it the leading variety in raisin production, this elongated oval shaped pale green sweet grape is very common for table/dessert use. An excellent variety for growing outdoors, particularly in temperate countries such as England, Boskoop Glory is a red grape bordering on purple black. It is ideal for making wine or eating as a dessert grape. The Concord grape was formerly the primary grape for production of grape juice, however it has now been taken over by Thompson Seedless. 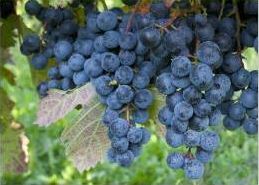 It is a red seeded grape having dark blue to purple-black skin, and is also commonly used to make jelly and some wines. This is a cultivar of the North American fox grape species. Cabernet Sauvignon is a red grape, commonly used to make red wine, and is one of the most widely planted of the six noble grape varieties (the varieties that produce the finest wines). Some of the finest wines in the world, including Red Bordeaux, are made from Cabernet Sauvignon grapes. A fantastic red variety, this is a cross between Thompson, Cardinal, and some other varieties. Flame grapes are almost perfectly spherical and so bursting with juice they are almost crunchy, and of course full of flavour. One of our favourite varieties, and one of the most popular! Merlot is a variety of wine grape used to create popular red wines. A red wine grape, Pinot Noir is used to make a dry red table wine, most commonly from the Burgundy region of France and California. It is a relatively low yielding grape, but it is persevered with because it is widely regarded to make some of the finest wines in the world. Another white seedless variety, Sugraone is a particularly firm and sweet variety. The most essential part of growing quality grapes after planting is pruning grape vines. You may also be thinking that pruning grape vines is such a boring task, besides I have got a great harvest this year, so what is the necessity of pruning? There is no denying of the fact that you had a great harvest without pruning, but are you more concerned about the quantity of grapes or its quality? Grape growers who have just started growing vines may think that pruning is just nonsense, since there has been a bumper harvest. If you come to such a conclusion you are making a big mistake and may have to pay a heavy price. Once you understand the importance of pruning grape vines, it will not seem like much of a problem for you but rather a pleasure. The important thing is to learn the correct process of pruning. You need to have a lot of patience as it may be three years before vines begin producing fruits. Vines should be allowed to grow for some time, at least for a year or two before you start major pruning, as this helps in strengthening the root system. In the first winter, the stems found at the base of the vine should be removed but care should be taken to keep the strongest stem. At a later stage this becomes the trunk which should be well supported using a wired fence or a grape stake. You should allow the growth of other stems from the trunk. In the second spring you should retain the two best shoots that grow out from the trunk. 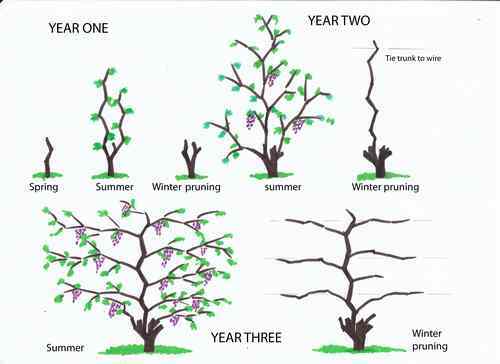 As the vine grows it reaches a certain height and it is necessary to cut back the weaker part of the trunk after that. This helps in new growth along the trunk. 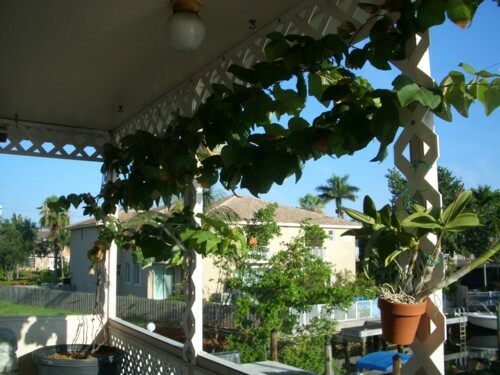 However, new branches that disfigure the vine need to be removed. In the winter of the second year you need to ensure that there is a basic structure of the plant, with a straight trunk and a set of side branches. The only thing that needs to be done in the spring of the third year is to keep trimming. A very crucial point is leaving about 10-15 buds in each arm during the winter of the third year. These are the ones which produce your bunches during the summers growth period. These buds are called ‘renewal bud’ and must have a couple of leaf joints. The renewal buds should be continuously pruned so as to allow new growth during summers, but care should be taken not to cut off buds that are already producing grapes. Pruning grape vines is essential because it removes a lot of over used mature branches from the preceding year and helps in new growth of the vine. If a vine is left as it is then a number of buds will be left behind and in theory will be able to produce a lot of grapes. However, this is not the right approach, as you will overload the vine and in the process the vine may break. Grape bunches don’t feed themselves on their own. The ripening process happens due to the support from the vine branches. The greater the number of bunches, the more energy and support that is required. If the number of bunches is large then the vine can reasonably feed there will not be enough energy so as to ripen all the fruit. As a result some bunches would not ripen properly and you will not be able to use much of the fruit. Even if you are thinking of having grape bunches for decoration only, still it would look better if they had ripened well. That’s why, pruning grape vines is so important. Grape Growing. Interest in wine shows no signs of slowing down—wine tours, tastings, and vacations are now common and homeowners often have space dedicated to their collection. The logical next step? Learning to grow and make your own.In The Organic Backyard Vineyard expert Tom Powers walks the small grower through the entire process of growing grapes, with a month-by-month maintenance guide covering all regions of the U.S. and Canada. He explains everything a beginning grape grower needs to know: how to design and build a vineyard, how to select grapes for each region, how to maximize yield using organic maintenance techniques, how to build a trellis, how to harvest at peak flavor, and how to store grapes for winemaking. Updated from his self-published version, this edition includes organic growing information and all new photography. The Organic Backyard Vineyard features everything a wine lover needs to build and care for a backyard vineyard.